Quiet, dignified, and affectionate, the Borzoi make great home companions and love being part of the family. Originally owned by Russian aristocrats, this breed was used to course wolves in large hunting parties. Borzoi were almost wiped out during the Russian Revolution due to their association of being owned by the aristocratic set. Some survived in Russia, and some made it to England and other European countries, where they became popular. 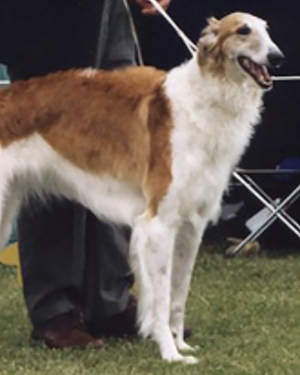 The first borzoi arrived in the U.S. in the 1890’s. Borzoi are not for everyone, they are unique hounds, almost cat-like in demeanor. They are far more sensitive and passive than other breeds of dog and thus do not respond to harsh training methods or treatment. 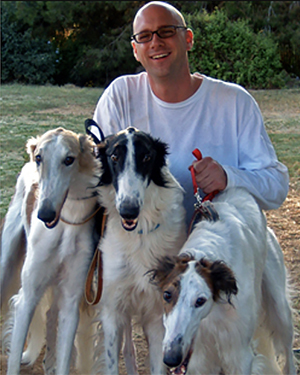 Borzoi are great companions, and like being part of the family. Couch potatoes in the house, they like walks and a good sprint in a well-fenced enclosure. They are not to be trusted off leash, unless in a secured yard. Being sighthounds, they are visually stimulated and enjoy car rides and being in places where there is a lot to look at. Borzoi attract a lot of attention. Expect to be approached by people inquiring about your dog. If you are not familiar with the breed, reading, research and interaction is strongly encouraged prior to bringing one into your home. Homes with a securely fenced yard (at least 5 feet in height); leashed if not in the yard. Mature owners and family with some sighthound experience is a plus. Owners who expect ideal obedience in their dogs. Owners who prefer to keep their dogs outside—Borzoi are not suited for outdoor living. Borzoi are not swimmers, but some like to wade, especially if they’re hot. Affectionate, beautiful, silly, quiet, and loyal. Can sometimes be unsafe with livestock; some will jump fences; can occasionally be destructive if bored; can sometimes be aloof. Care must be taken when walking on leash: if a Borzoi sees a cat, squirrel, or other small animal, you may find the leash being jerked right out of your hand. On average, Borzoi weigh between 65 – 110 pounds, and stand 27 – 34 inches at the shoulder; females are usually smaller than males. Any color or combination of colors. Good with well behaved children. Not recommended for very young children. These dogs are prey driven. Each dog is different, be careful around cats and small animals. Most are fine with other dogs. Heavy shedding certain times of the year; we recommend grooming 1 or 2 times per week. 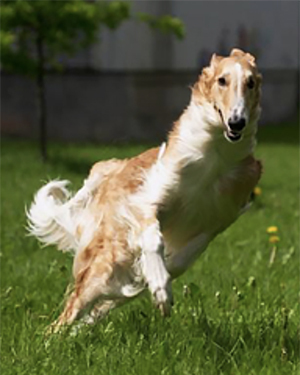 Health issues known to affect Borzoi include bloat and torsion.